And that was when I knew things looked grim for Atletico Madrid. There were a couple poor passes in transition, and one particular defensive mishap, early on, where I knew that Diego Simeone’s outfit was out of it and was likely to lose. And lose, they did; 3-0. But before the final whistle blew, and Atletico supporters everywhere were left wondering what they had just witnessed, Karim Benzema, at the six-minute mark, had a point-blank shot that he couldn’t settle into the net and past Jan Oblak. The build-up to the chance, however, is where you could see that Atletico was going to have trouble coping with Zinedine Zidane’s game plan, coupled with their incredible technical prowess. The video below illustrates a lot that was wrong with Atletico and great about Real in this match. Zidane likely had a feeling that Atletico was going to be more aggressive and expansive, as they have undergone a tactical transformation this season, and knew that they had to exploit this. In the video above, we see an Atleti outfit that failed to take advantage of good passing and movements that lead up to the edge of Real’s penalty area. Furthermore, when Atleti counter-pressed well and won the ball back, they yet again struggled to produce chances, especially with little to no space in the central areas. In the same sequence of play when Real Madrid won the ball, Marcelo used his skill and speed of touch, to beat an Atleti counter-press that was taking form. The Brazilian’s technical ability is massive when playing out the back. Another key aspect that led to Benzema’s early chance on goal was the way in which Zidane used Luka Modric and Casemiro to play close together in the build-up phases, with the Croatian drifting wide when the ball was switched. It should also be noted that Atleti’s forwards didn’t track back as much as usual, highlighting Simeone’s desire to really focus more on troubling Real’s backline. This made it harder for Atleti to cause overloads down the flanks where Real Madrid work best. Above, we see how Isco took advantage of a spaced out, four-man Atleti defensive box by attracting Filipe Luis inside and leaving Dani Carvajal to have more time to run behind. The three-minute video showcases how, in theory, Simeone wanted to play more expansive and did it quite well in some counter-attacking and build up phases, but lacked the finishing to hurt Real Madrid and in turn left his side to transition into a defensive block that wasn’t as compact as times past. So, when you’re constantly not taking advantage of chances and good transitions, you’re leaving a less-organized low-block to have to deal with world-class attacking talent like Real Madrid’s XI. Atleti were looking to score a goal or two early on, and then become ultra-defensive to close out the game. They failed and were left chasing from the moment Cristiano Ronaldo scored his first goal in the 10th minute. Anyway, read on as Eat Sleep Drink explains how Atleti’s poor execution in the attacking phases of their play was the biggest reason for their downfall. It wasn’t all bad for Atletico Madrid despite what other commoner media reports may say. 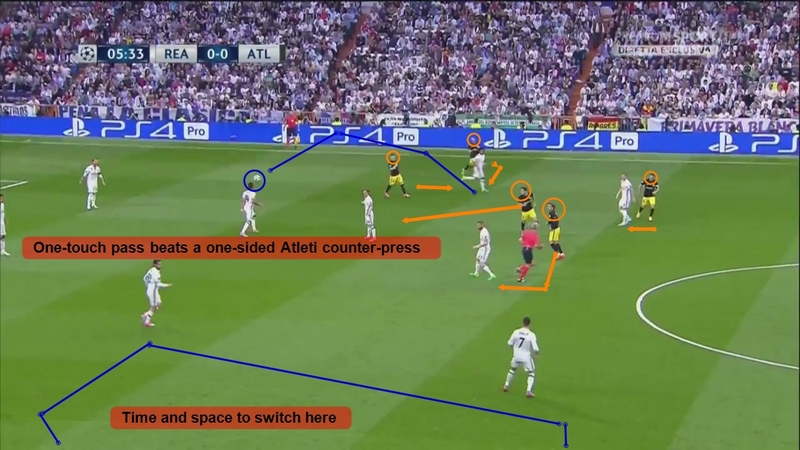 From a tactical point of view, and if you pay attention to detail, there were moments where Atleti’s offensive and aggressive approach worked in some aspects. Some of Atleti’s build ups and counter-pressing led to decent combinations that neared Real’s penalty area. However, a good final ball or moment of brilliance was lost on almost every single occasion. Oh, and Koke’s performance was massively disappointing. The video below showcases just how poor Atleti were in attack. Real Madrid moved the ball quickly, very quickly. They exploited an Atletico Madrid game plan that wanted to take them out of the match quickly. Simeone’s men wanted to score early, and do what they do best: defend well and not concede. But, amid their good counter-pressing and decent build-ups, Atleti failed their coach in the attacking phases. They couldn’t produce quality chances or finish when the opportunities arrived. Zidane got a great result. His side possessed the ball and forced a less-organized Atleti defense to rely on their backline to come up big in more 1v1 situations due to getting less help, especially on Ronaldo’s last two goals. When you’re constantly giving up chances in your end, and with nothing to show for in your attacking phases, then, well, you’re going to struggle to play fire with fire against Real Madrid. If they were going to open up their defensive block, Atleti needed their attacking talent to finish and take Real’s confidence out early.